I came across a great case study showing the effectiveness of mystery shopping in the senior housing industry. This is an emerging industry that is important to our aging population and their family members. As senior housing is a big decision, facilities want to be sure that their staff are disclosing accurate information, making the tour experience as positive as possible, and even handling the more simple, basic tasks such as answering calls and returning calls promptly. 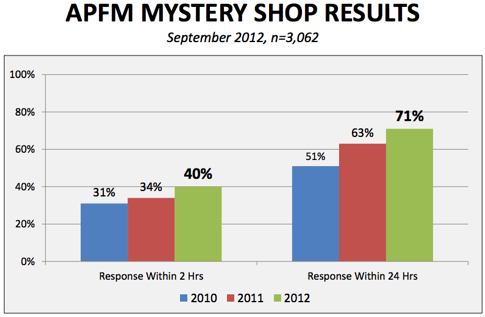 One company demonstrated how utilizing a mystery shopping program has helped increase response rates by their staff. Sometimes it’s hard for upper management to really know what’s going on when customers contact the business, and mystery shopping can give managers the data they need to see what their customer sees and make actionable decisions based on the information they get through an objective, third party program. Mystery shopping in any industry can do wonders for employee performance. It gives companies insight into what their customers experience, and to be honest, it keeps employees on their toes – they are aware that shoppers are out there, but never know when a visit will take place. In turn, they need to treat every customer as the shopper so their performance scores remain high. It’s a great methodolgy to measure and monitor employee performance and the customer experience, no matter which industry you’re in.